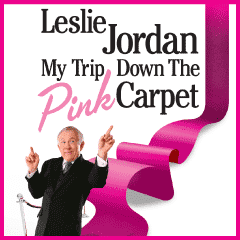 Probably most famous, at least for me, for his cracking cameo appearances in Will & Grace as Karen Walker’s arch-nemesis Beverley Leslie, My Trip Down The Pink Carpet is Leslie Jordan’s one-man show which takes stories from his memoir of the same name and creates a highly personal, highly amusing 90 minute journey through his life. The show mixes in anecdotes from Jordan’s career in Hollywood with tales from his boyhood in small-town Tennessee as a young man coming to terms with his homosexuality in the face of a Southern Baptist upbringing. These stories are most touching, the coping mechanisms developed in order to get through the school day, the remembrance of the trepidation and fear felt before entering his first gay bar painfully recognisable and the shift that happens once that threshold has been crossed feeling like the hugest load being lifted from the shoulders. The name-dropping was great fun too though as Jordan recounted tales of a jobbing actor in LA: he worked with a pre-ER George Clooney who has evidently always been a prankster; the Faye Dunaway story was both hysterical (she finds her best light even when she’s off-camera) and moving in her enduring affection for Tennessee Williams: Marlee Matlin, Rue McClanahan, Boy George and Mark Harmon also got fun mentions. But there was also the slightly darker side, the necessity for him to ‘butch’ up in roles and the abuse he tolerated, and the unresolved personal issues that led him down the road of alcohol and substance abuse until he was finally forced to face his personal demons. I wasn’t 100% sure about the occasional playing of 70s disco classics which seemed to interrupt the flow rather than add anything of value, although his depiction of the two types of gay dancing was hilarious. This was one of his first shows in London so the general flow of the show to fit around British attitudes to applause will come with time, several big revelations were delivered with expectant pauses afterwards which weren’t always filled (to be honest, I hate applauding midshow) and he could afford to lose a couple of the popular US culture references which felt a bit dated in any case, never mind being lost on much of this audience (Janet Jackson’s Superbowl incident for example). But I loved the fact that he steers clear of the kind of motivational-speak that can be so nauseating: true, his story is at times inspiring, especially in his honesty about himself and the lessons he has had to learn but he never preaches, which is most refreshing. The Apollo theatre is a curious choice of a venue for this show and I really hope that it doesn’t turn out to be a bit of a miscalculation. As two wise gentlemen agreed with me when discussing the show earlier this week, this is the perfect show for a more intimate location, the confessional style being more conducive to a cabaret-type atmosphere and whilst Jordan has the personality to fill the Apollo, part of me does question whether there will be the demand here for to fill a four-week, eight-shows-a-week run. I really do hope so as it is such an engaging show, borne out of a touching openness and a real sense of the journey travelled to acceptance of the self which should appeal to anyone, regardless of sexuality or stature. Leslie Jordan is absolutely amazing! He was in Steak & Co. few days ago having dinner and managed to get the attention of everybody… simply eating a steak. Such a scene stealer! !